7.28.2013. July was a shoulder-to-the-wheel kind of a month for the Collector's apprentices (who would be me and our guest apprentice Brendan McD, the Collector being "himself," JZ). We handled hundreds of objects and added more than 340 items to our database, but along the way, we also had a few laughs, as well as the occasional moment of awe (Cooperstown, Niagara Falls). Brendan reported that the best part of his month (aside from the Baseball Hall of Fame) was writing. I enjoyed his writing too -- watching him struggle, guiding him a little, seeing him have some breakthroughs, helping him get his pieces posted and out to an appreciative audience. Day 1. Started taking documentary photos of a collection of large-format Civil War photos, many by George N Barnard , Timothy O'Sullivan, and Alexander Gardner. Did some general viewing of collectibles in the afternoon with Jim's son Eric. Resulting essays: Photo: Elmira Cornet Band (by me) and Reflections on a photograph of Fort Sumter, 1866 (by Brendan). Day 2. Finished up Civil War photos in the morning (27 photos in all). Moved on to photography of oversized photos and prints, as well as an album of 19th c. celebrities assembled by "a Boston lady." Day 3. Finished cataloging the oversized photos (12). Sorted through old Harper's Weekly and Leslie's Weekly from the Civil War era, putting them in chronological order, and getting involved in the stories of Lincoln's assassination. Resulting essay: Thoughts Upon Reading the News of Lincoln's Death (by Brendan). Day 4. Cataloged the rest of the Civil War photos (stereo views) and moved to the collection of Winslow Homer and Thomas Nast woodcuts from Harper's and Leslie's (38 prints). Resulting essay: Winslow Homer's War :Finding Inspiration (by me). Day 5. 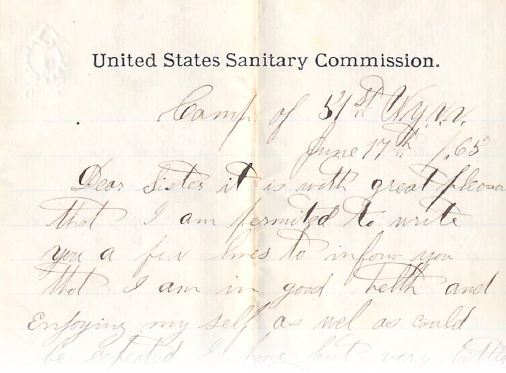 Dug into the eternal project of transcribing Civil War era letters. Resulting essay: The Letter Writers (by me). This week Brendan also began another eternal project: that of listing our reference books into a database at LibraryThing. Day 6. Civil War letters: Jim continued transcribing from old handwriting; Brendan continued transcribing from typescript or Jim's writing to computer; I worked on formatting the results into a pleasant, readable web page. Resulting model web page: Uriah W Stratton: Profile of a Civil War Hero. Day 7. Brendan continued work on CW letters while Jim and I had other business to attend to. Day 8. Organized Civil War letters into folders by stage in the work process. JZ continued his transcribing, while Brendan and I photographed and tagged photogravures from the Photo-Secession school of early 20th-century photography (41 items). Then I gave Brendan a couple boxes of Gilbert Dey material to review, interpret and report back on. Day 9. 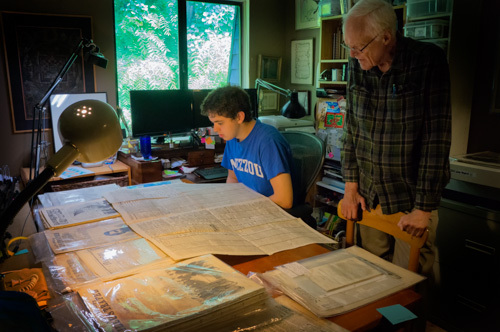 Brendan input all the Photo-Secessionist material into the database, then continued work on Gilbert Dey, who was a Kodak executive involved in the development of aerial photography during World War I. Day 10. Finished up Gilbert Dey. Resulting essay: Reconnaissance Mission, 1917 (The Gilbert S. Dey Archive) (by me). Then Brendan and I made fast work of photographing and cataloging more photography: from modern (7), the U.S. West (35), and African-American (11) categories. By the end of WEEK 2, the apprentices were bored with the grind of documenting stacks of photos and prints. Our delight and curiosity were fading. So, time to retool. We turned to Africa for inspiration. 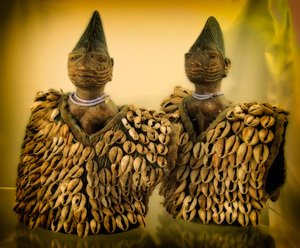 Since Brendan's main distraction was rap songs, I proposed that we try to connect the dots between 19th-century west African (specifically Yoruban) culture and 21st-century rap. The days did not have specific tasks to accomplish, but as we worked across the table from each other, our minds were deeply engaged in African magic and its influences on American sensibilities. We both struggled mightily with our writing. Lots of connections were sensed and researched, but, gosh, so hard to wrestle all those big thoughts into words and paragraphs. While I concentrated on the arts, Brendan gave himself a crash course in the history of rap. My ears were entertained and educated along the way. Resulting essays: Connecting Cultures: Searching for Yoruba Roots in America (me); I Should Be a Hipster (Brendan, incl. audio version); Connecting Cultures: Eyes and Ears (me); What Is Art? (me); Walking That Mile In Another Man's Art (Brendan). Day 16. Exhausted from all that deep thought and creative writing from last week, the apprentices were happily back at more mindless activity. Brendan attached photos to about 400 records of African and Asian collectibles in the database. Then we photographed and catalogued 19th-century Japanese photos (along with a handful of other Asian photos and some Japanese photo albums) -- 47 items in all. Day 17. Brendan attached photos to another 500 or so records... completing a large task I had been avoiding. Days 18-20. We put away the photo-studio equipment and tackled Jim's collection of Civil War books. About 10 shelves in Jim's study are packed with CW books, both antiquarian and recent. 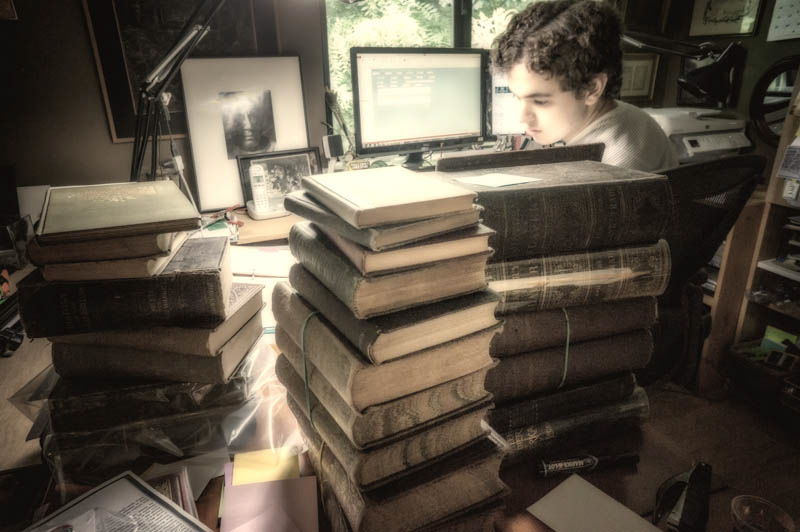 I pulled the antiquarian books off the shelves, made note of any peculiarities, and Brendan entered them into the database (having to learn some bibliographic jargon along the way). Meanwhile I was also pulling out the recent, mass-market books on Lincoln, slavery, war and reconstruction, identifying many duplicates, gleaning some of the "fluff," and thereby creating a giant pile of "donations" in the hallway (about 60 books). Overall, this turned out to be a gigantic task. One day turned into three. But we got it done! The 91 antiquarian books are documented and all 270 books* are back on their shelves, newly organized. Brendan picked out some of the giveaways as presents for his friends back home and the rest will be carted to the local library. 1: Brendan up to his neck in antiquarian books about the Civil War. 2: Brendan and JZ examine a newspaper reporting Lincoln's assassination. Documentation process includes documentary photo, cropped and tagged in Lightroom, then entered into an Access database. Research along the way involves either books in our reference library or Google.